How often have you been guilty of opening your mouth and saying the first thing that comes to mind, undaunted by the potential for repercussions? This isn’t an entirely inadmirable quality: after all, you do have much wisdom to impart. But the Queen of Swords appears to you today as a harbinger, heralding a better approach toward meeting your objectives. It’s a call for you to listen, use your head, think strategically, and make sure that what you say doesn’t get drowned out by all the static reverberating around you. Look at the imagery in this card. The Queen of Swords is barely visible, half-hidden behind the ravens that are perched on barren branches. Only her eye, peering through the raven’s wing, is clear. 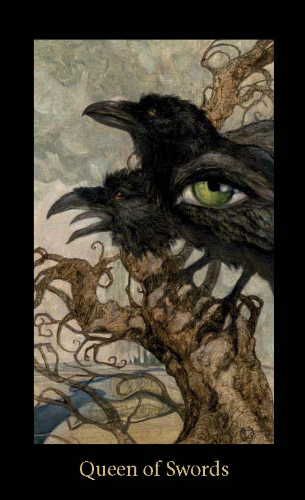 The ravens in this card — Norse mythology’s Huginn and Muninn — are shamanic shape-shifters. They represent Thought (Huginn) and Memory (Muninn) that send Odin to a trance-like state. An interesting side-note (or synchronicity as this card was pulled without looking at astrological correlations) is Mercury’s conjunction to Algol today. Algol is an eclipsing binary, called the “blinking demon” by some. The image in this card — and the conjunction to Mercury which Jodie Forrest so eloquently referenced above is uncanny. The Queen of Swords, in this context, speaks of using your intellect, your observation skills and your thoughts to maintain control. While you do have much to say, pausing to think and gather your wits about you will help you to process your ideas. Your goal today should be to streamline your ideas and express yourself with clarity and purpose. You may have to cut through some noise. But you’ll be a lot more effective in getting your point across by looking before you leap and thinking before you speak. 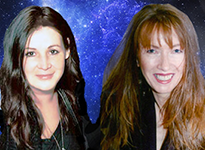 Today’s tarotscope is part of the Mary-el Tarot series by Marie White, published by Schiffer Publishing. Used by generous permission. Original art, as well as full-sized prints, are also available on her website. Please check out and “like” this deck’s Facebook Fan page.